It's beginning to look like bur oak blight, or BOB for short, is a long-time resident of Iowa, and he's here to stay. 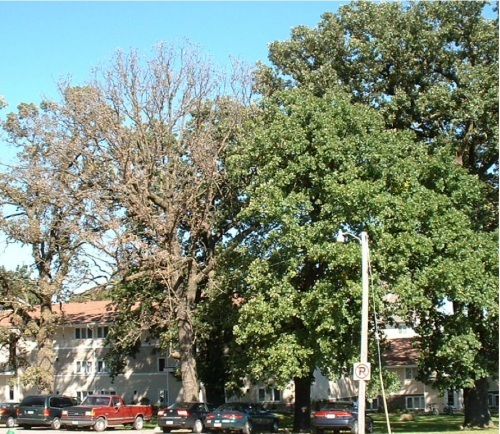 Bur oak blight has been recognized in Iowa for only the last 6 or 7 years, but the fungus that causes it has probably been here much longer. A shift in climate to more frequent rain events appears to be increasing the severity of BOB throughout much of the western two-thirds of the state. The same phenomenon that contributes to Iowa's now all-too-common floods may be helping BOB kill our state tree. 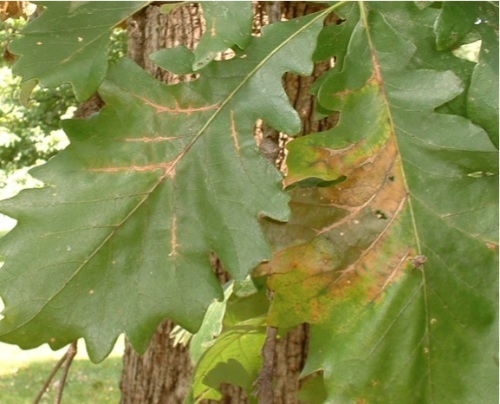 A common leafspot fungus, Tubakia dryina, was initially thought to be the cause of the blight on bur oak, but closer examination showed that the cause was a new species of Tubakia. With funding provided by the US Forest Service, we were able to show that there are five species of Tubakia that can infect bur oak, but only one species can cause dramatic leaf symptoms and tree mortality. The disease tends to intensify year-to-year in individual trees, and if only a portion of the crown is affected, it usually starts in the lower branches and then later progresses up the tree. The fungus overwinters on the petioles of dead leaves that remain attached to branches. Spores are produced in May from black pustules on the petioles of these old leaves, and the spores infect the newly emerging shoots and leaves during rainy weather. Dramatic leaf symptoms do not become evident until July, however, and the severity of symptoms increases in August and September if weather conditions are right. Leaf symptoms include necrosis (death) of the tissue along the veins and wedge-shaped areas of browning at the tips or sides of the leaves. 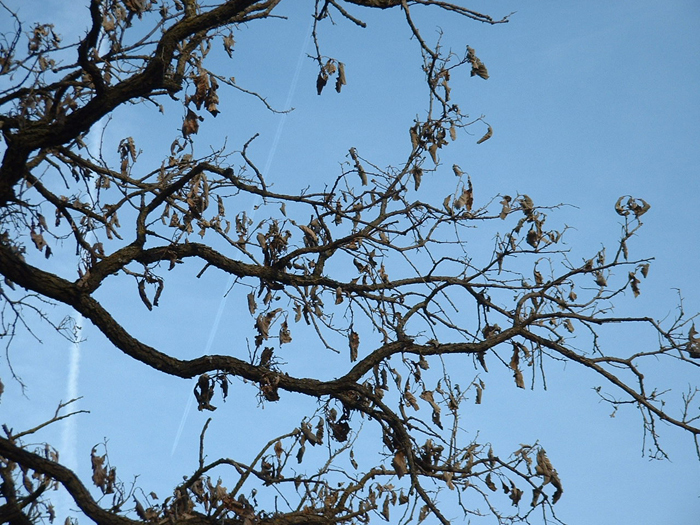 Severely affected trees may die after several years of severe defoliation. Not all stands of bur oak are seriously affected by the disease, and not all trees are equally susceptible in even the most severely affected stands. Thus far, we have seen severe BOB on only naturally-established bur oak, especially on mature trees on upland sites that appear to be remnants of savannah forests. Bur oak in dense forests and in bottomland sites are less seriously affected. We have confirmed the pathogen in 55 of Iowa's 99 counties, but most of the severely affected stands have been in the western half of the state. We've also confirmed BOB in eastern Nebraska and southern Minnesota. We are experimenting with fungicide injections for control of BOB in high-value trees. Injections of propiconazole (Alamo) into bur oak in late May or early June, before symptoms appear, have been effective. 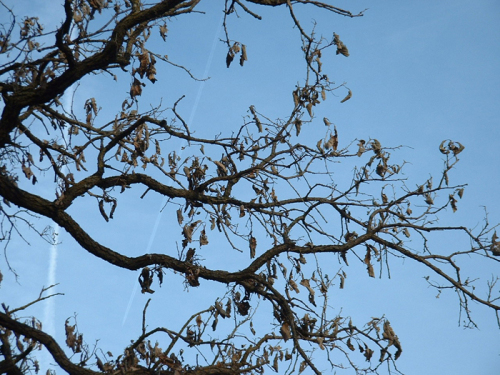 However, propiconazole at the rate recommended for oak wilt can be phytotoxic to bur oak, and the treatment is costly. As long as the rains keep coming, BOB will probably continue to intensify on upland sites across much of Iowa, and we could lose a number of stately bur oak. Hopefully our next generation of bur oak should be better adapted to a wetter climate and have the resistance necessary to withstand our long time resident, BOB. An 18-minute video on the symptoms and other characteristics of BOB is available on the ISU Extension website. Leaf symptoms of necrosis (death) of the tissue along the veins. Photo by Tom Harrington. These scattered diseased leaves were still hanging on the tree in February. The fungus produced rain-splashed spores from pustules on the petioles of these old leaves to infect newly emerging shoots and leaves in April and May. Photo by Tom Harrington. 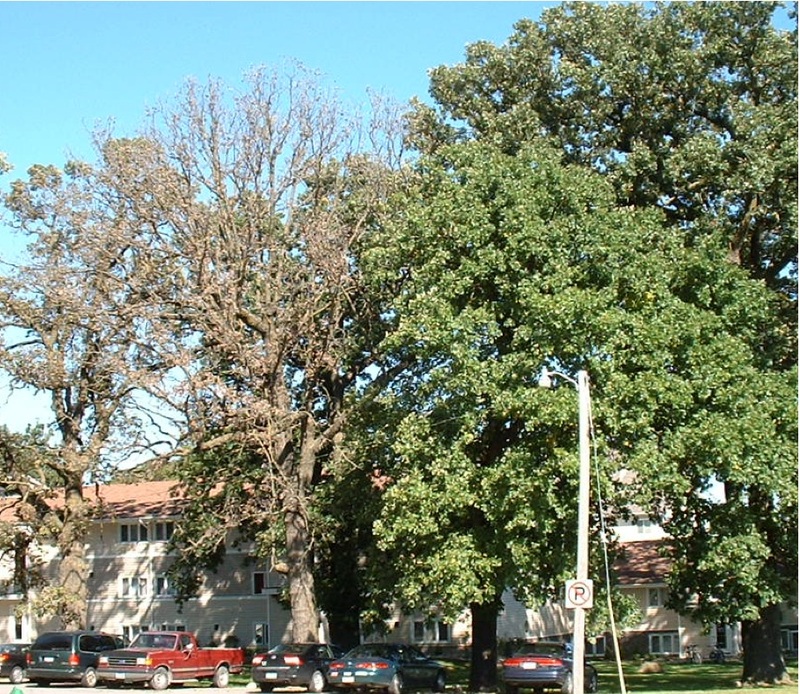 Two trees on the left have dead leaves hanging on their branches in Sept. 2008, but the other bur oak trees show few or no symptoms. Photo by Tom Harrington. Links to this article are strongly encouraged, and this article may be republished without further permission if published as written and if credit is given to the author, Horticulture and Home Pest News, and Iowa State University Extension and Outreach. If this article is to be used in any other manner, permission from the author is required. This article was originally published on February 9, 2011. The information contained within may not be the most current and accurate depending on when it is accessed. My trumpet vine is growing vigorously, but isn't blooming. Why? I have an old apple tree that is starting to decline. I don't know the variety, but would like another tree. How can I propagate it? I would like to plant some raspberries this spring. Is it best to purchase new plants or can I transplant some from a neighbor's garden?